Over the last few months several people have complained to me about some feature of the site not working (for them). Without fail every one of those folks who had issues was using either Microsoft's Edge or Internet Explorer web browsers. Things like not being able to see the site's pop-up charts, or the full page of charts feature or nothing happening when clicking the "Add to Watchlist" or "Add to Portfolio" buttons. There are probably other things which are also broken. Basically, if you're using a Microsoft browser and you've experienced clicking/tapping on things and nothing happening, it's likely because a failure within your browser. All the aforementioned functionality works fine in Chrome, Firefox, Safari and even on Android (Chrome) devices and iOS (Safari) devices. If you can't switch browsers, you can try clearing your browser's cache but I'm not sure if that will work or if you won't have to clear it again the next time I update the site, which happens pretty frequently. P.S. Microsoft recently announced that they're effectively throwing in the towel on their own browsing engines and instead will be adopting the Google Chrome (Chromium) engine. So you may as well take that hint and change your browser now! Thanks to the good folks at Trade.it and their API you can now sync your actual brokerage account to a SwingTradeBot portfolio. 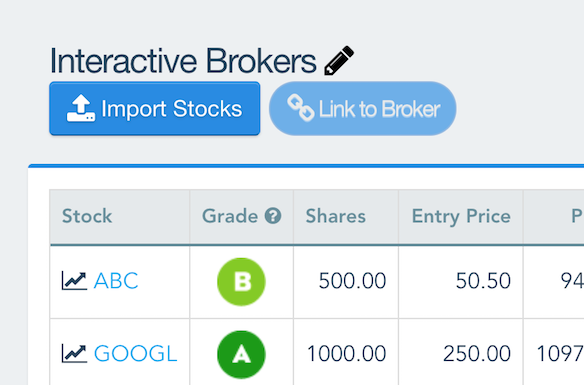 No longer will you have to manually add & remove positions in order to match what’s in your portfolio. SwingTradeBot will sync your portfolio a couple of times each day to keep things updated for you. Clicking that button will open a pop-up which will allow you to select the CSV file to upload. Recently I've had an increase in people asking me if they could pay for a subscription with PayPal. These requests have increased since I started the non-USA versions of the site and folks from around the world are subscribing. In some cases people don't feel comfortable entering their credit card info and in other cases their banks won't allow them to pay in USD. So to address those concerns I've decided to start accepting PayPal for annual subscriptions. It's just annual subscriptions for now because this will be a manual process until I can get some time to fully integrate PayPal with the automated subscription handling built into the site. Instructions for paying via PayPal are on the subscriptions pricing page. P.S. I've also started rolling out plans priced in local currencies (and currencies other than USD). Those plans will allow people to use the site's Stripe credit card form to subscribe and they'll be charged in the currency of their preference. I'll write more about those plans in the next several days.